There’s no better time than right now to set your farming operation up for a successful planting season and start the crop year off right. While 2015 harvest is in the rear view mirror, there are still many important decisions to make and activities to prepare for the 2016 planting season. One way to be proactive and take the crucial step to make sure you’re making the most of every acre is to generate variable-rate seeding prescriptions. Variable-rate seeding prescriptions can help farmers maximize the productivity of many hybrids by better distributing their seed to leverage high yielding areas. In fact, one of the benefits of variable-rate seeding is allowing a grower to plant the best population for a hybrid according to different management zones within the field that may vary for soil type, elevation, drainage and other important agronomic attributes. Over 60% of farmers own equipment capable of executing variable-rate seeding prescriptions, but only ~30% of farmers use variable-rate seeding on their farm (Source: Precision Ag Meister Media Survey 2014/2015). In the last decade, we have seen tremendous improvements in variable rate equipment technology – from requiring manual planter adjustment in the field to change seeding rate, to cab-controlled manual population adjustments, to the automated prescription execution we enjoy today. Building variable-rate prescriptions has traditionally been a complicated process for farmers and their trusted advisors. It requires a lot of time and the ability to understand hybrid response to population and expensive, complicated desktop software to create seeding rate prescriptions, and file formats and upload procedures to precision agriculture equipment can be overly confusing. That’s why most farmers rely on static seeding rates across the entire field, or in some cases, the entire farm. Just as equipment has evolved and made field execution of variable-rate planting easier, prescription generation also is getting much simpler – Script Creator, a new tool in Climate FieldViewTM Pro is a great first step in easily creating simple variable-rate prescriptions. Script Creator is an easy-to-use but powerful tool that can help you maximize performance of those carefully chosen hybrids by planting the right population on every part of your field. The tool first provides an image of your field boundary and creates zones based on the different soil types in that field. With this easy-to-use tool, you can view basic information about each soil zone and/or customize zones to account for management practices, irrigation pivots, or set up test plots within your field. Then, simply assign a corn hybrid, population rate and review your script summary. You also can share access to your Climate FieldViewTM account with your trusted advisor who can generate seeding rate prescriptions on your behalf. Script Creator saves you time by allowing you to export your prescription to your device of choice, whether it’s the Climate FieldViewTM Cab app, myJohnDeere, or other planter monitors that can read shapefiles. When it’s time for planting, your Precision Planting 20/20®, GrecnstarTM 2630, or other variable rate capable planting equipment will ensure what you plant in the field is what you wrote in the prescription. Brett grew up on a small corn/soybean farm in central IL, and studied crop science, plant breeding, and genetics through school. 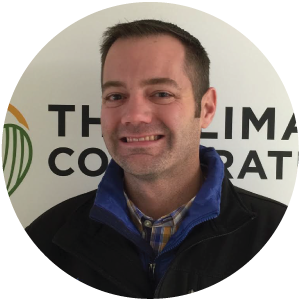 He joined Monsanto in 2008 as a Commercial Corn Breeder, and in 2014, he joined The Climate Corporation to help develop precision ag and data science products. Brett leads a team of agronomic scientists that serves as agronomic translators of ag data sources, and helps increase agricultural knowledge among data science, statisticians and engineering colleagues to develop and implement field research to drive improvements to The Climate Corporation’s modeling efforts.